ATLANTIC CITY, N.J. (CNS) — Baseball is back for the spring and Bishop Dennis J. Sullivan of Camden didn’t hesitate to remind the 800 people who joined the diocese’s recent follow-up to the 2017 national convocation of Catholic leaders that it’s a new season for the church as well. “Today is opening day for your church,” Bishop Sullivan told clergy, religious and lay leaders at the closing Mass of the four-day “Convocation of Catholic Leaders: The Joy of the Gospel in South Jersey” at Harrah’s Waterfront Conference Center in Atlantic City. 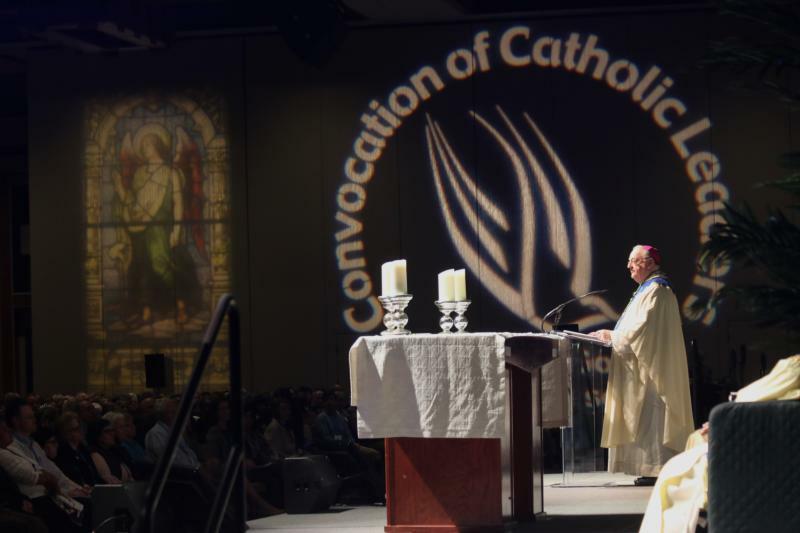 Four years later, in July 2017, a national convocation inspired by the document took place in Orlando, Florida, organized by the U.S. Conference of Catholic Bishops. It featured speakers and workshops to create fertile soil for missionary discipleship throughout the United States. Bishop Sullivan and 23 delegates from South Jersey who traveled to Florida enthusiastically returned to the Camden Diocese and quickly prepared for the March 25-28 diocesan convocation, which hosted teams from each of the diocese’s 63 parishes. The event became a celebration of faith and served as an emphatic call to missionary discipleship, with an openness to dialogue, creative thinking and envisioning new ways the local church can proclaim the Gospel in the future. Each pastor in the diocese chose 10 delegates from his parish to attend. Ideally, they were to represent different heritages, backgrounds, ages and viewpoints. There also was an effort to seek parishioners who have gifts and talents that have not yet been realized on the parish level. Donna Ottaviano-Britt, diocesan director of missionary discipleship, will meet with each parish to discuss strategies on implementing a sustained culture of encounter and discipleship in their communities. “This is not a winding down, but a winding up,” Father Chris Mann, pastor of Christ the Redeemer Parish in Atco, said afterward. Leadership consultant Christopher Lowney was among the gathering’s plenary speakers. His book, “Everybody Leads,” was required reading for the delegates in advance of the convocation. “People need to see the work of the Lord in us,” Lowney said, stressing the importance of “intentional leadership.” He urged participants to not be afraid to step out of their comfort zones, past their familiar places and faces, to evangelize. “Get your shoes dirty for Jesus,” he said. Other plenary speakers included Cardinal Joseph W. Tobin of Newark, New Jersey; Julianne Stanz, director of discipleship and leadership development for the Diocese of Green Bay, Wisconsin; Hosffman Ospino, associate professor of Hispanic ministry and religious education at Boston College; and Carolyn Woo, a global development fellow at Purdue University. Delegate AnnaMarie Mahieu, from Our Lady of Perpetual Help Parish in Galloway Township, New Jersey, found strength at the convocation amid difficult personal times. Her grief almost prevented her from traveling to Atlantic City, but it was her surviving son and daughter who told her to go, knowing that the longtime volunteer and past director of adult catechesis would find healing. She did, along with a renewed purpose for her mission. “This week has filled me and showed me that God wants me to keep moving and be joy-giving like Jesus. He’s not done with me,” she told the Catholic Star Herald, newspaper of the Camden Diocese. The diversity and unity of the church were evident during the four days.